Late Summer Wedding - Hong & Servet's Love Shines! Wedding in Columbus, Ohio! Hong and Servet asked me to be their officiant at Franklin Park Conservatory after I had the honor of marrying their friends at Scioto Reserve! I never get tired of marrying brides and grooms. Each ceremony is different - each relationship, like a fingerprint! The love and energy that each bride brings to her groom, and groom to his bride, is unique. I must say at times it is awe-inspiring, and warms my heart in a way unlike anything else. I believe it also is a reminder of my own marriage, and the love that Jean and I share that continues even through the many challenges we have faced in life for the past 30-plus years. This love relationship that husbands and wives share is one of the great mysteries of our existence. For this reason, it is something to celebrate! Therefore, I want each wedding to feel so special and unique to each couple, so that they will remember their day with the utmost joy. In this first photo Hong and Servet share some humor, laughter, and smiles! Hong and Servet in Columbus Ohio with wedding officiant, Damian King, at Franklin Park ConservatoryThis next shot shows Hong walking the aisle as she approaches her groom in the Brides Garden at Franklin Park. 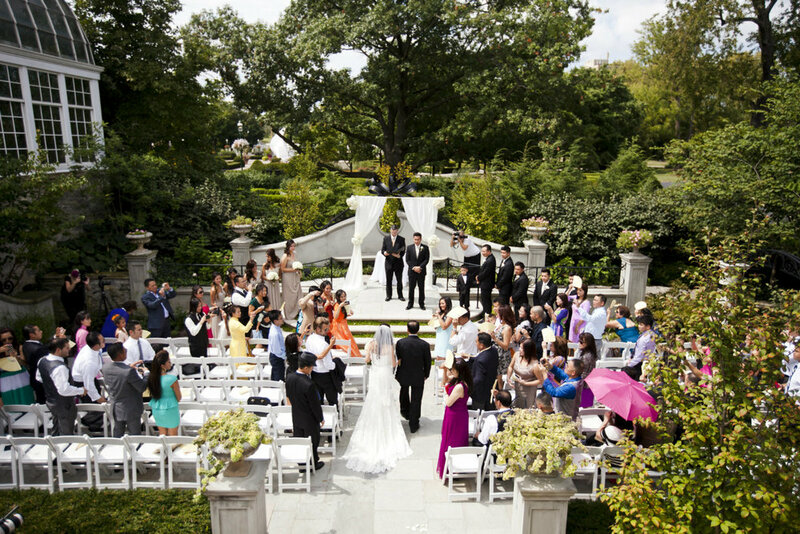 This location is a favorite at the Conservatory, especially for smaller, outdoor weddings. Servet waits for his bride, Hong, in Columbus, Ohio, as wedding officiant will soon ask presentation question!Their wedding kiss! Hong and Servet share their kiss as they have been pronounced husband and wife before their family and friends. What could be more cool? Wedding Kiss in Columbus Ohio! Hong and Servet rejoice in their moment as officiant applauds with guests and family!The happy couple, now husband and wife, walk the aisle arm in arm, ready to face the future together in the embrace of their undying love. Gotta love this! Joyful moment for bride and groom, Hong and Servet, as they exit as husband and wife at Franklin Park Conservatory!Now I'd like to give credit to Hong and Servet's wedding photographer! Her name is Tessa Berg and her photography company is Starling Studio! You can contact Tessa by following the link provided. Also her email and phone number are info@starling-studio.com and 614-423-9094. Please visit her website to see some of the other great photography work that she does! Wedding videographer was Dane & Leslie Khy of The Perfect Pear. It was great to work with them. Live strings by Columbus Musicians and Ian Jones. Thanks for taking to time to visit our website! Come back soon, if you'd like! Older PostFabulous Wedding Video at Creekside!